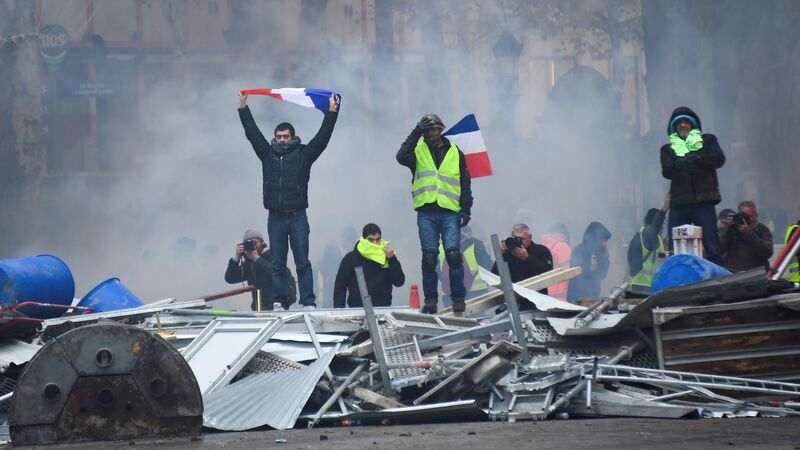 Parisian law enforcement used tear gas and water canons on a crowd of thousands of activists protesting rising fuel taxes and French President Emmanuel Macron on Saturday morning. By the numbers: 5,000 protestors surged around the Champs-Elysees on Saturday, and six protestors have already been arrested, according to the AP. The nationwide protests have taken place all week with an estimated 23,000 participants, according to Interior Minister Christophe Castaner. Thousands of police have been deployed, hundreds of people have been injured, and two have been killed in accidents related to the protests, the AP reports. The backdrop: Macron has claimed that the rise in fuel taxes is necessary for moving the nation away from its dependence on fossil fuels. He's expected to defend new plans for transitioning to renewable energy on Tuesday, according to the AP. The big picture: Macron's popularity has reached a new low amid the unrest, according to a new poll by French pollster BVA.